Over a dozen anti-war activists staged on Monday a blockade of an alleged missile factory in the UK county of Worcestershire at a site owned by the Roxel company manufacturing equipment for rockets and missiles after claiming to have uncovered evidence of the mass assembly of missiles intended for export to Saudi Arabia at the facility. Jointly owned by the Paris-based Safran group and the Europe-wide armaments manufacturer MBDA, Roxel manufactures an assortment of propulsion systems intended for air to air, air to ground and ground to ground launched missile systems, something anti-war groups fear are being purchased by Saudi Arabia. Over the past three years, a number of peace groups have slammed the UK government for delivering UK-made bombs and missiles to Saudi Arabia that leads an international coalition carrying out airstrikes against the Houthi movement in Yemen at the request of the country's President Abd Rabbuh Mansur Hadi. "What prompted this action though was what appears to be an order of a thousand missiles on the SIPRI Arms Transfer Database. So we felt it important to get down there to the Roxel factory and do something to protest what was going on," Nicholas Cooper, a spokesman for the Christian peace group called "Put Down the Sword," told Sputnik. Protesters arrived at the Roxel site at around 10:00 a.m. local time (09:00 GMT) and blocked the primary entrance to the factory. 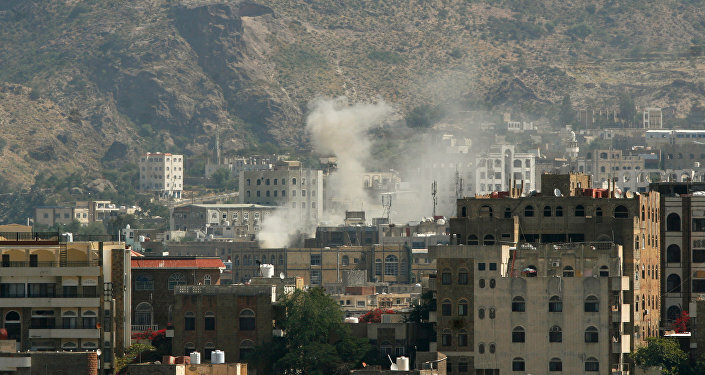 Several other activists attempted to gain access to the factory proper, hoping to talk to senior management and present evidence of alleged war crimes in Yemen, some of which are believed to potentially involve Roxel missiles. "Obviously, we were all peaceful and I think people's reaction to us was peaceful, but we were surprised we did actually get to speak to somebody senior in the company. The human resources manager met myself and two others and he appeared to want to listen to our concerns," Cooper said. Thus, the activists presented the evidence of the weapons deal with Saudi Arabia to the HR manager and went on to speak of the country's war crimes in Yemen, which, according to Cooper, was left without any reaction by the factory's employee. "When I asked him directly as to what he was making and where it was going he basically could not tell us. He said he was not able to talk about that. He also did not give a reaction at all to the war crimes we were talking about," Cooper indicated. Protesters have then engaged in a prayer session to honor those killed since the launch of the Saudi-led coalition's military campaign in Yemen in 2015. "Yemen for me is a very British issue as Britain has sold so many weapons to Saudi Arabia, so I feel a particular responsibility, being British, to do something about that," Cooper acknowledged. According to Cooper, it hurt him to watch the UK government's dismissing the appeals of numerous human rights agencies to halt arms exports to Saudi Arabia engaged in a bloody campaign. "With the Saudi air force targeting civilian targets… I'm convinced there are multiple cases of war crimes going on, and I fear it could escalate into a much more serious war," Cooper warned. London's continuing support for Saudi Arabia has proven contentious for much of the UK population, with polls indicating that just six percent of British citizens approve of continued arms exports. The growing discontent with the UK-Saudi Arabian partnership has already found its manifestation in a series of protests during the visit of Saudi Crown Prince Mohammed bin Salman to the United Kingdom in early March when hundreds of people descended on Downing Street to protest his talks with Prime Minister Theresa May. 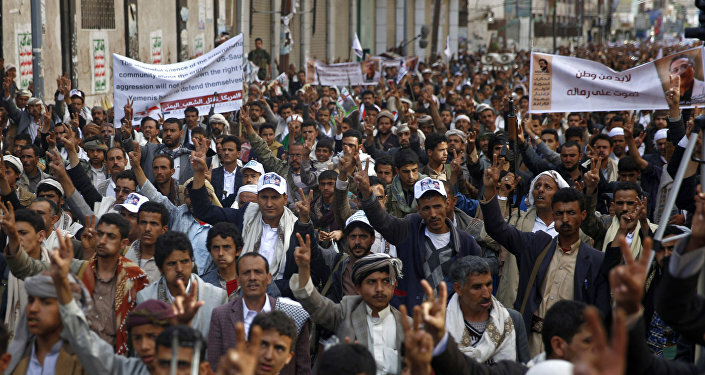 During manifestations many anti-war activists waved the Yemeni flags and openly accused both London and Riyadh of instigating a "humanitarian disaster." Stephen Bell, a spokesman for the Stop the War Coalition, told Sputnik at the scene that it marked "the beginning of a long struggle and a shift in British politics away from uncritical support for the Saudi regime." According to figures compiled by the Campaign Against Arms Trade (CAAT), over 4.6 billion pounds ($6.4 billion) worth of military equipment has been approved by the UK government for export to Riyadh since the start of the Yemeni campaign three years ago. Whereas the UK government continues to insist that such sales are in compliance with the international law, critics have become increasingly alarmed at increasing civilian deaths, lack of aid supplies and a sweeping cholera epidemic contributing to the humanitarian disaster in Yemen.